The Roma is a Littorio Class Italian Battleship. She was used ineffectively during W.W.II, and was sunk by a German Glider Bomb on 9 Sept 43 while in route to Malta to surrender. 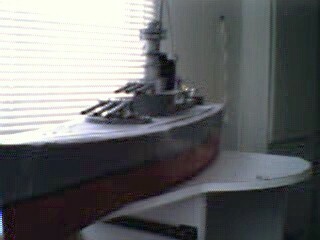 This model was built by MBG member Jason Annen. I painted the smokestacks black for identification. It looks a lot like the American South Dakota class battleships, and there were frequent "friendly fire" accidents. I battled this ship for two seasons and have just recently traded this ship for the Mikuma because the Roma (at just over 61 inches in length) was too big to fit in my car. 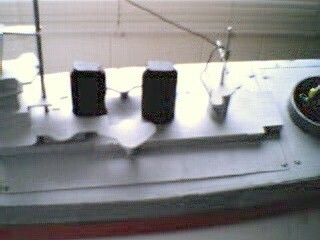 View of the 6 forward 1/4" cannons. This is an old picture from Jason Annen's web site. I wanted to show the prop and rudder location. In this picture you can also see some of the damage that we take during battle. The ship has since been painted gray. For more, go to Jason's site located at the Valpariaso Shipyards. Thanks again for the picture Jason!